Kid’s School Benches & Playground Seating – Glasdon, Inc.
At Glasdon, we design and manufacture children’s seating which is fun and durable, whilst also encouraging heaps of creative play! The Lo-Co™ kid’s bench is deal for use in a range of environments, from schools and kindergartens, to playgrounds and parks. When we design a playground bench at Glasdon, we aim to make it suitable for a variety of different applications. 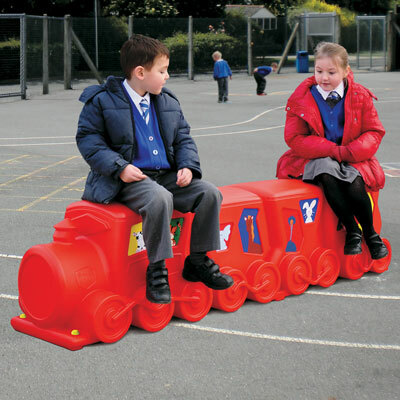 Our playground benches for schools are suitable for both indoor and outdoor environments, and can easily be moved to different locations. We also offer the option of a reliable ground fixing kit, which will allow installation in a more permanent location. The additional color options available when choosing your children’s bench, alongside additional extras such as an eye-catching sticker kit, encourage children to interact with our seating, whilst the different curves and textures of the product provide a range of intriguing, tactile surfaces. Manufactured from a high-quality, hard wearing Durapol® Material, the Lo-Co Train Seat™ is low maintenance and easy to wipe clean, whilst also being highly robust and weather resistant. To coordinate with your new kids seating, Glasdon also offer a range of striking animal shaped trash cans and playground bins, which encourage children to dispose of their garbage responsibly. These trash cans are designed to complement your children’s seating, and can be a great addition when creating a child-friendly play area for your location. If you require any further information about our kids seating, or our range of animal shaped trash cans and playground bins, talk to us today!